Before going ahead and choosing a garage door, you need to make sure your intended choice will actually fit your needs correctly. There are three main types of doors, and each one of them can offer you different benefits. 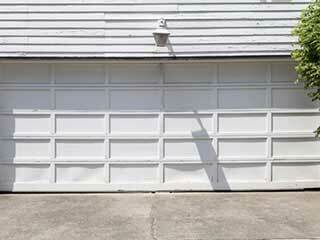 Single panel garage doors are basically one big slab that opens similar to the way a car hood pops up and down. Doors of this type used to be considered more "in style", at least before the sectional doors came and overshadowed them. They tend to be less expensive than other types of doors, but their structure is their disadvantage. A single panel door requires plenty of headroom due to the nature of its operation. Not all garages are built to have sufficient space for it, so naturally, this is something that has to be checked before you make a purchase. This is the most commonly used garage door type. A typical sectional garage door consists of three to six panels (some have up to eight!). These doors are very durable and do not require as much headroom as they fold against each other. They also have another significant advantage: if the door is hit in some-way, you can save quite a lot of money by replacing only damaged panels, instead of the entire door. However, these doors are usually slightly more expensive and will require some additional maintenance. Sliding doors are also a great option to consider. They have a very good aesthetic appeal and make use of both overhead tracks and bottom tracks in order to open. They can slide on a track and open outwards, like in an old-timey barn, or sideways over the wall. They have the same disadvantage a single panel door has in that if they are hit – either in a storm or by a car – fixing it will probably require replacing the entire door. In general, garage doors can be made of many different materials, but the most common ones are wood, aluminum, and steel. Each material has its own benefits and disadvantages, so you should consult with one of our experts before deciding. The second thing you'll need to decide is which type of door seems like it would be better suited for your home. Style is important, after all. Lastly, the cost. Don't forget to be conscious of your budget when making your decision. Call our experts at Garage Door Repair Staten Island for more useful advice.